I have so many polka dot nursery ideas to share that you might say that I’m seeing spots before my eyes. Mom-to-be are bouncing circles are all over the place in baby's rooms these days. They are being used in all colors and sizes to an extent that I never dreamed possible. And for the time being, it looks like they are here to stay. There are polka dots on the walls, the baby bedding as well as on decorations that you can make yourself. One of the amazing things about polka dot nursery ideas is that they complement so many popular nursery themes. 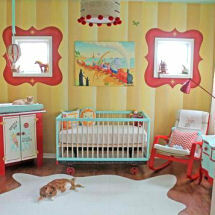 They are seen in modern nurseries as well as rooms with vintage decor. The dots in an old-fashioned room would be smaller than those in a more contemporary space. Circles and dots even find a place in the most popular nursery theme ever; the jungle theme! Geometric fabrics featuring both are seen in nursery curtains and crib sets. Polka dot baby bedding sets, as is the case with any other pattern, comes in all colors. For baby girls whose mom dreams of polka dot nursery ideas in hot pink there is pink polka dot crib bedding, for baby boys there is blue polka dot baby bedding. And as baby bedding manufacturers never leave well enough alone, there are collections of stripes and polka dot baby bedding for decorators who like a break from straight polka dot nursery ideas. The easy way to spiff up a baby’s nursery wall with dots is to use polka dot decals and stickers. They are reusable, removable and easily relocated. What more could a mom want in the way of quick and easy polka dot nursery decorating ideas? You would think that painting polka dots on the wall was something brand new but I picked up on this decorating trend a few years ago. 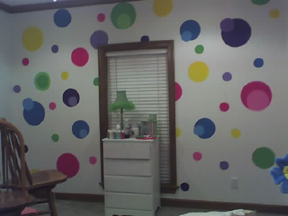 If you will be so kind as to remember my friend, Ms. Jeffery, shared a picture of her niece’s bedroom where she and her sister had painted dots of all sizes and colors that was just cute as can be. She also gave instructions on how to paint polka dots on the wall for those of us with less artistic talent (namely me). 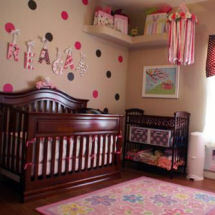 We have lots of pictures of decorated nurseries and kids bedrooms decorated with polka dots. You will be amazed (as was I) at how many cute ways that they can be used to lighten and brighten any home’s décor. Do you have some pictures or polka dot nursery ideas that you would like to share? Use the form to upload your baby nursery pictures, to get decorating advice or to share your opinion on decorating with polka dots.